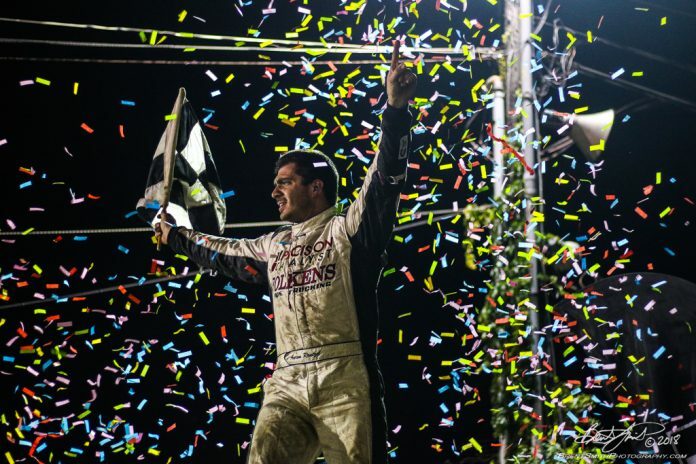 BECHTELSVILLE, PA – Aaron Reutzel did what some would consider the impossible on Thursday night at Grandview Speedway: beat the Pennsylvania Posse on their home dirt. Although Reutzel was in charge the entire distance, the 35-lap main event did not count down without a challenge for the Clute, Texas, native. The former ASCS national champion and now All Star Circuit of Champions driver point leader was forced to deal with an immense amount of pressure from multiple drivers with most of the chaos occurring during the second half of the program. Between laps 20 and 28, things were getting interesting for Reutzel. 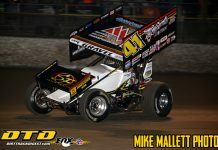 Tim Shaffer, who started from the pole position by way of dash victory, was starting to nip at the heels of Reutzel as the duo attempted to navigate traffic. At the same time, Paul McMahan, who actually raced in the runner-up spot from lap 11 until lap 20, was also beginning to apply pressure on the top pair, soon joined by fifth-row starter, Freddie Rahmer. 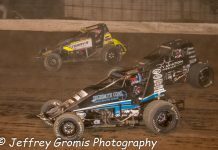 By lap 22, Rahmer and McMahan each worked by Shaffer, eventually igniting a battle with each other that included two official position changes in three laps. Meanwhile, Kyle Larson, who started ninth, was also starting to come alive, soon working his way to fourth behind Reutzel, Rahmer, and McMahan. 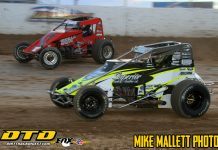 The hornet’s nest calmed down on lap 28 when back-to-back caution flags appeared, one for a spinning Tim Shaffer, ultimately ending the four-car battle for the top spot. The pair of cautions on lap 28, and another caution on lap 33, acted as a saving grace for Aaron Reutzel, allowing the Texan to utilize a clear track and clean air. Despite a mad attempt by Larson, pounding the cushion on the final two circuits in hopes of sneaking around the top-three, the intent failed. Reutzel escaped to win by 1.3 seconds at the final checkers followed by Freddie Rahmer, Kyle Larson, Paul McMahan, Chad Kemenah. Williams Grove Speedway in Mechanicsburg will host the traveling All Stars on Friday, August 24, for the highly anticipated Jack Gunn Memorial. The annual program will feature a pair of 20-lap features each awarding a $4,000 top prize; the first twin feature format at the world-famous paperclip since 2015. Tony Stewart’s All Stars last visited Williams Grove Speedway in April with Lance Dewease picking up the high dollar payday. Dewease went on to sweep the weekend with the All Stars, also winning the Keith Kauffman Classic at Port Royal Speedway the following evening. Williams Grove Speedway in Mechanicsburg, Pa., will allow pit access beginning at 5 p.m. on Friday, August 24. The All Star drivers meeting will happen at 6:30 p.m, followed by hot laps at 7 p.m., sharp. Those looking for more information should visit Williams Grove Speedway on the Web at www.williamsgrove.com.